Pricey, dealer-installed smart-home systems have one thing in common: A wall-mounted panel with a flashy LCD to control everything. This is the feature that's most difficult for a do-it-yourselfer to duplicate. 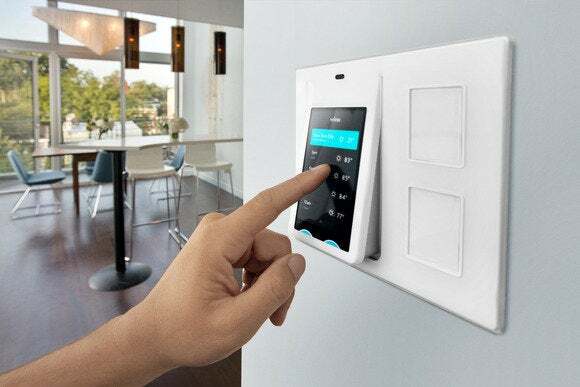 So I was intrigued when I heard the DIY-friendly Wink Relay controller had gone on pre-sale for just $300, and that it can manage a wide range of self-installed smart light switches, door locks, thermostats, security cameras, and other devices. The hype bubbling around the Wink Relay is that it solves the protocol Tower of Babel—that it doesn’t matter which language your smart device speaks, the Relay can control it. But that’s not entirely true. Yes, it speaks Wi-Fi, Bluetooth, and ZigBee, but it doesn’t support Z-Wave; and Z-Wave is one of the earliest and most widely supported smart-home protocols. A brief conversation with Wink VP Brett Worthington resolved the question: Homeowners who wish to control their Z-Wave devices with the Relay will also need to purchase the Wink Hub ($50 street price). The Hub is a display-less controller that receives commands from the Wink app and sends them to all sorts of devices, including Z-Wave. “The Hub has six radios in all,” Worthington said. The Wink Relay is designed to replace an existing light switch, but you can control that light using one of the smart switches to the right of the touchscreen. In a perfect world, it wouldn’t matter which language the devices in your smart home spoke. And if projects like the Nest, Samsung, and ARM initiative Thread work out, we just might live in that world someday. But for now, the companies building programmable lighting controls, intelligent thermostats, wireless door locks, and other smart products are hedging their bets and supporting multiple protocols. Wi-Fi is the most common, of course, but its steep power requirements render it unsuitable for small, battery-powered devices. ZigBee devices require much less electrical power, and the standard is more open (like Wi-Fi, it’s based on an IEEE standard); but its early adoption was hindered by fragmented development efforts. But if you buy both the Wink Relay and the Wink Hub, you should be able to buy devices without worrying about which protocol they support. With its 4.3-inch touchscreen display and a graphical user interface running on top of Android, the Wink Relay looks like a smart phone that you hang on your wall. The problem with too many control panels is that they depend on wall warts for electricity. What could be uglier than having a cord hanging down the wall beneath your fancy control panel? The Relay panel replaces any standard electrical switch (in a one- or two-gang junction box, consuming slightly more room than a double-gang panel. Two mechanical switches to the right of the panel can act as replacement light switches, or you can custom-program them to control one or more other smart switches in your home. The switches are strictly binary; you can’t dim the lights they control, but you can program the Relay to dim any lights connected to switches it can communicate with. A built-in mic and speaker will eventually render multiple Relays capable of operating as an intercom system. An integrated proximity sensor wakes the panel up when you approach, while temperature and humidity sensors monitor your home’s internal environment. A built-in speaker produces event notification sounds, and there’s an integrated mic that can operate as an intercom system if you install multiple controllers in your home (although that’s a “coming soon” feature). Installing the Relay involves handling bare electrical wires, so a disclaimer on Wink’s website recommends professional installation. Risk of electrical shock is one reason why so many of its competitors require dealer installations, but Wink provides all the tools a do-it-yourselfer will need—including a wire stripper—so the company clearly anticipates most people will DIY. And based on the video on Wink’s website, it looks like a very simple job. There are three limitations: There must be a neutral wire in the gang box, the switch you’re replacing cannot be connected to an AC outlet, and the switch cannot be on a three-way circuit (meaning the circuit can’t be controlled by a second switch somewhere else in the house). The Wink Relay doesn't just hang on your wall; it installs inside your wall. You must be on your local Wi-Fi network to program the Relay using the Wink app, which is available only for Android, Android Wear, and iOS operating systems. But you can control connected devices using the Wink app from anywhere you have Internet access. There is no PC client, however, and while Wink servers are in the cloud, there is no user-facing web portal that would allow you to program it remotely. Wink has long list of supported devices on its website, ranging from Dropcam security cameras to the Nest programmable thermostat; Schlage locksets to Philips Hue lighting; and even Lutron motorized window shades. You can also install multiple Relays in your home, so you don’t need to walk into another room to control everything. Worthington offered to send an eval unit for review shortly before the Relay ships to buyers. The device sounds very promising, and I’m definitely looking forward to checking it out.